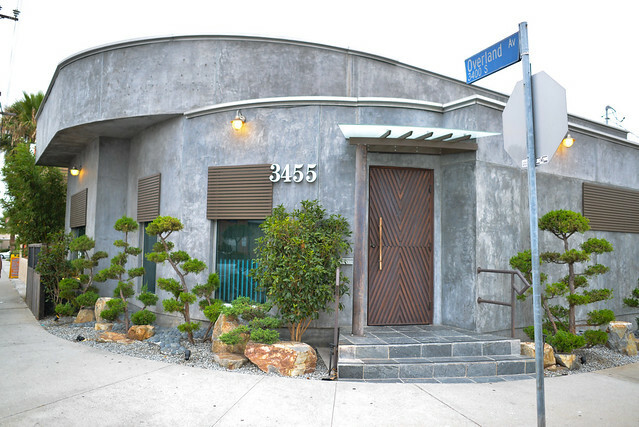 n/naka opened three years ago in a quiet corner of Palms on the westside. 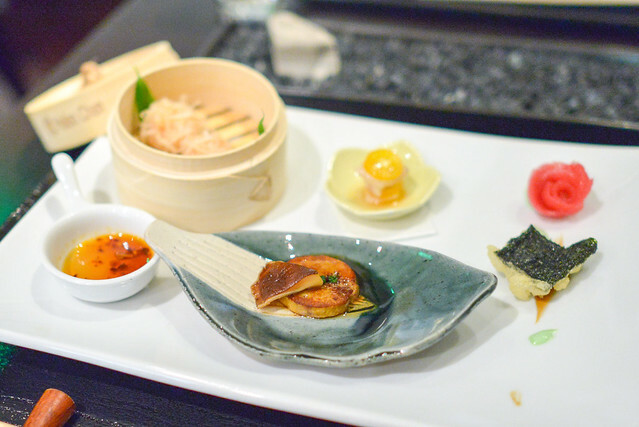 The restaurant and its modern take on the Japanese kaiseki meal, has focused on creating a very precise multi-course meal with seasonal ingredients. 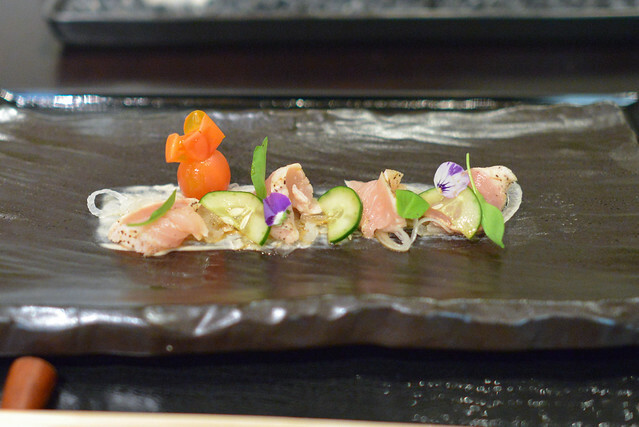 Many of those ingredients are grown by chef Niki Nakayama herself in her own garden. I still feel the restaurant is somewhat under the radar; sure, Jonathan Gold has continually mentioned the restaurant in high regard (it was #18 in his 2014 best restaurants list), but I don’t feel like it’s consistently being considered with other high-end restaurants in LA. 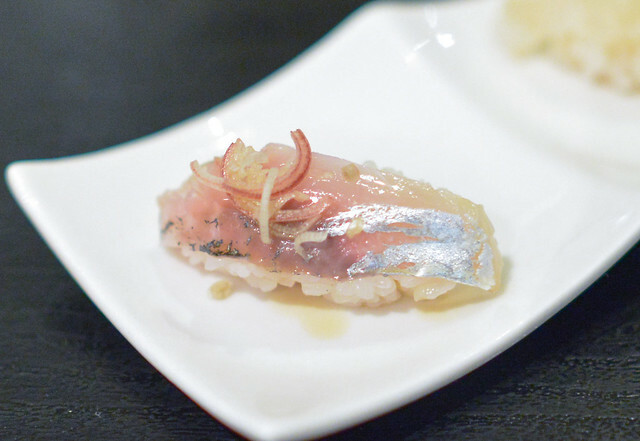 While common in Japan, n/naka’s kaiseki-based menu is pretty unique in LA. It’s a carefully-scripted tasting menu often featuring 10+ small plates. Seasonal ingredients (usually simply prepared) are highlighted, and service and plating/decor are as much a part of a meal as the food. The thirteen course menu weighs in at $165 ($150 vegetarian) making n/naka one of the most expensive restaurants in the city (there used to be a slimmed down chefs’ tasting for $110). The meal began with this fried squash blossom stuffed with a cool blue crab filling. 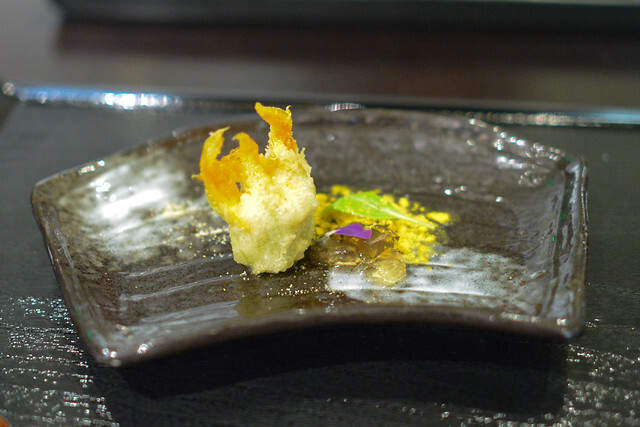 The contrast of crispy warm blossom with cool sweet crab was a good one, brightened by the carrot sorbet. Loved the presentation of this quartet of small bites. 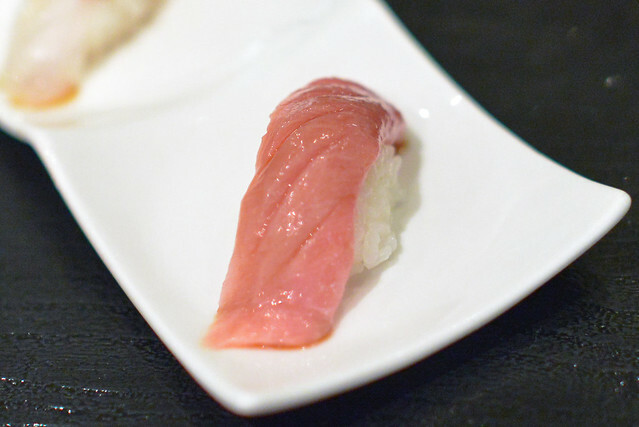 Sliced tuna, in the shape of a rose, was complemented by a piece of fried seaweed while ankimo was seared in a sweet/savory sauce. 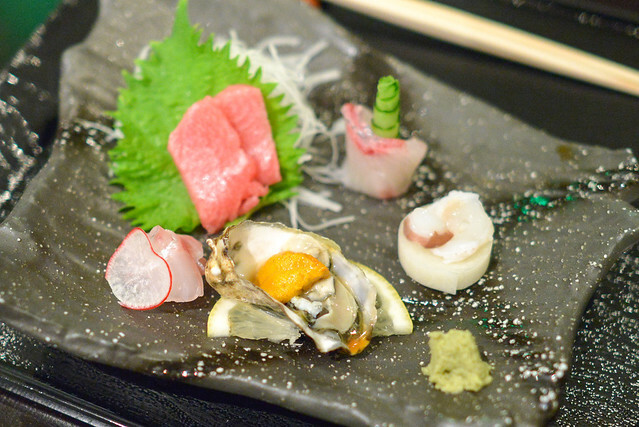 My favorites were probably the bright kanpachi ceviche and the tender lobster shumai. Sliced albacore benefited from a light smoky flavor, accompanied by sweet onions and tomatoes. Light and refreshing. 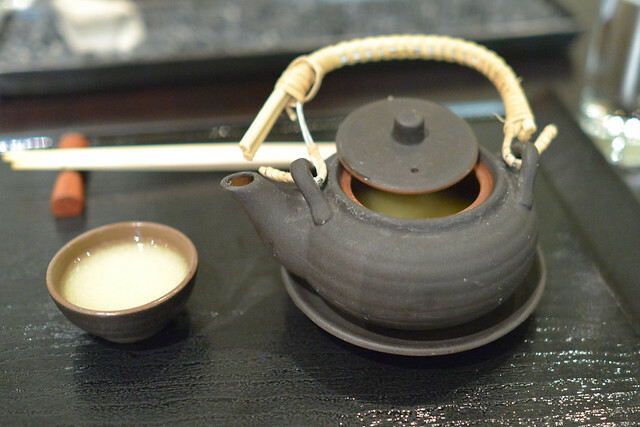 This soup was delicate, though rather rich in flavor – sweet corn and crab were upfront. Chunks of both the corn and king crab were eaten after the soup was finished. The sashimi plate came next. 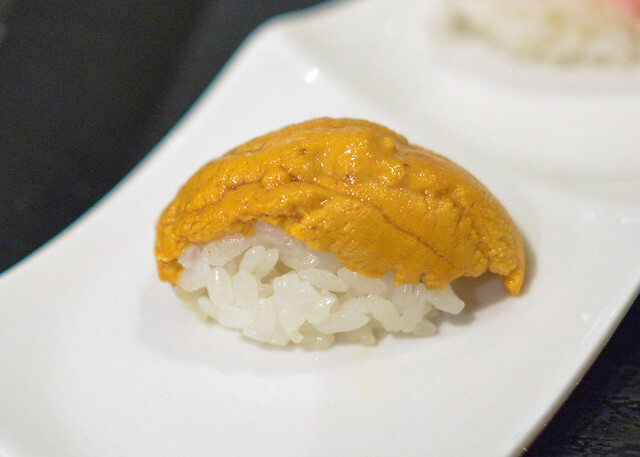 All of the fish were great; uni-topped Kumamoto oyster as well as the utterly rich toro were highlights. Unfortunately I forgot to take a picture of the next course – a grilled Hokkaido scallop with a potato chive sauce, ikura and creme fraiche. Bacon bits and a bacon powder added plenty of depth to the shellfish. 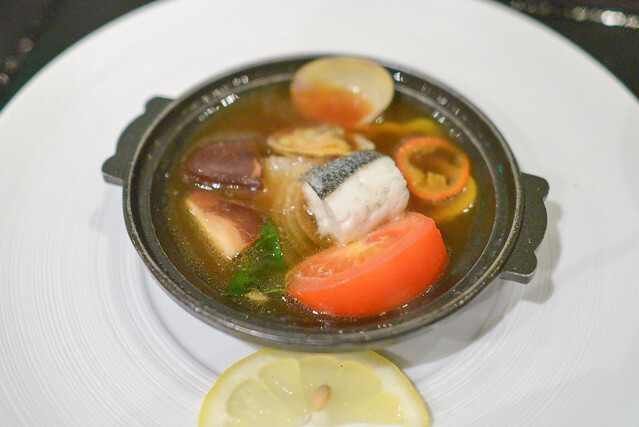 A deep salty broth brought together bright onion and tomato flavors with the meaty shiitake and suzuki sea bass fish. Not the most exciting of dishes, but it was tasty enough. 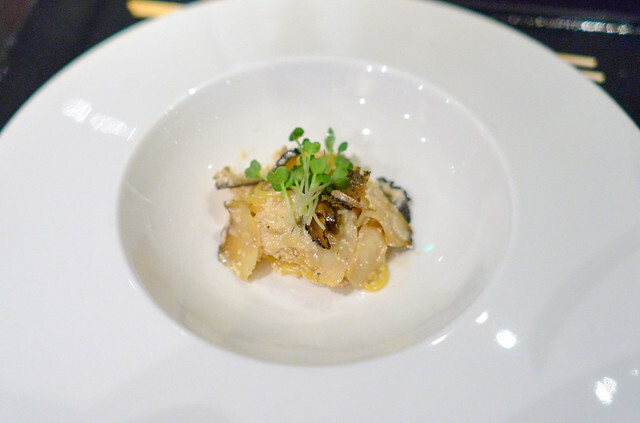 Garlic, mentaiko and butter formed a rich base for Monterey Bay abalone and summer truffles. The spaghettini was toothsome and the earth-and-sea flavors came together really well. Delicious. A slice of beef, more fat than muscle, was the show in this A5 wagyu course. Some simple seasonal vegetables complemented the rich slice of delicious meat. 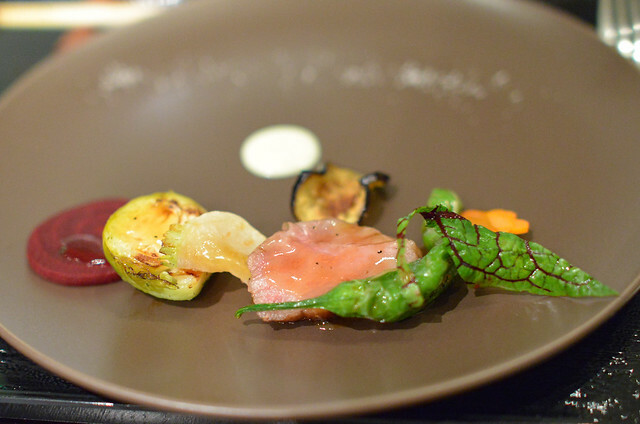 Clean flavors were present in this small course signaling the move from rich beef to sushi. 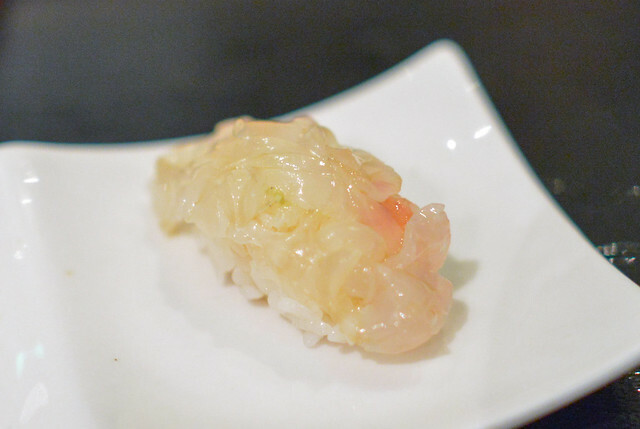 Plump sweet shrimp was accented by a bit of caviar and zesty yuzu. 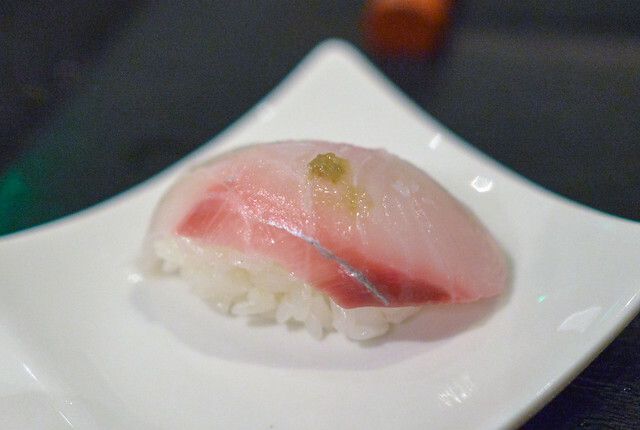 The toro was silky and oily as expected though slightly fishy; the tai snapper presented some leaner, cleaner bites. 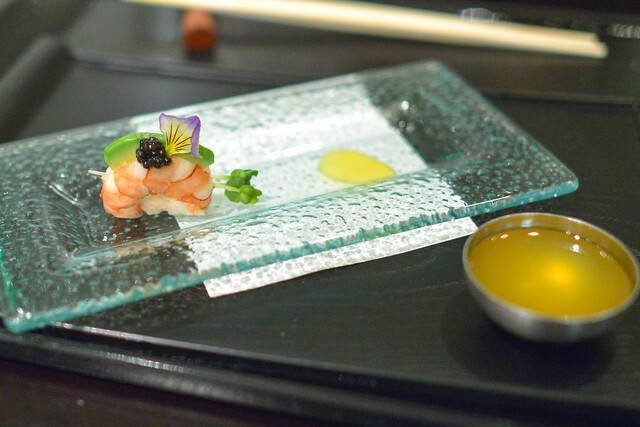 The sweet shrimp amaebi was a highlight in this pairing, while the aji exuded some richer, more flavorful goodness. The uni, from Santa Barbara, was very nice. 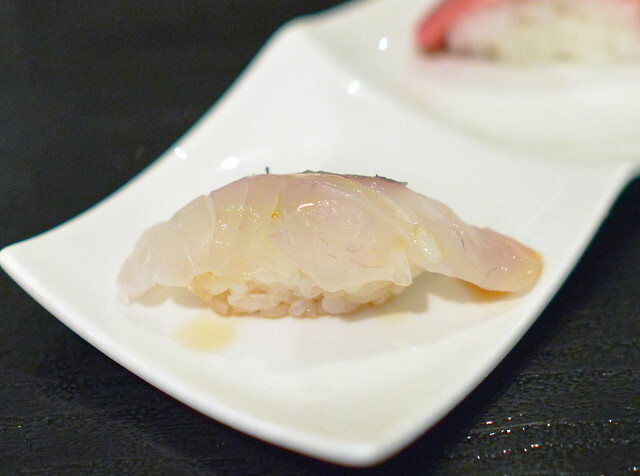 Smooth and luscious with great flavor to go along with the lighter striped jack shima-aji. We ended the savory courses with this soba. 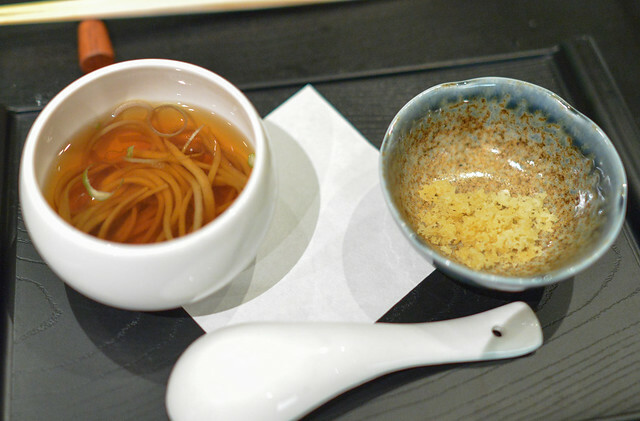 The noodles had a nice chew and were slurped up in the salty dashi broth with tempura flakes. 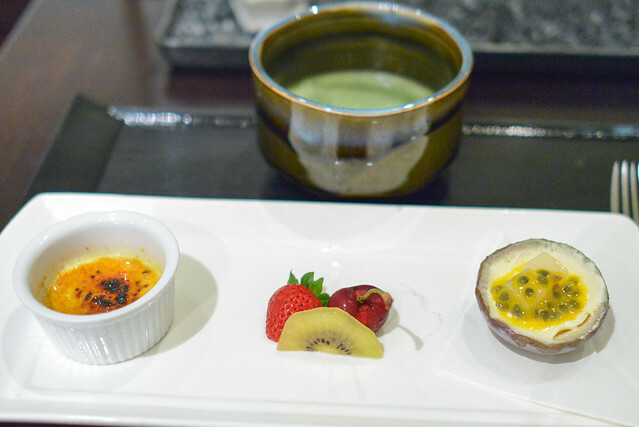 A trio of desserts completed the meal with a bowl of matcha. My favorite had to be the black sesame creme brulee. n/naka presented a very good meal. Precise execution was at the forefront, simply preparing a variety of high quality ingredients. It’s definitely not cheap, but the menu showcased a ton of different flavors and preparations while the food was pretty consistently delicious. Plating was beautiful and service was very strong from start-to-finish. I really think n/naka would be good choice for a special occasion; most other high-end Japanese spots are more casual and sushi-centric while this kaiseki meal presented a more complete fine dining experience (particularly to a Western palate).